Surrounded by mountains, Patterdale valley get's more than it's fair share of rain (almost double that of Penrith just 12 miles away). As can be seen from the rainfall records, it is 'normal' for us to get 2.5m to 3.0m of rain a year (that's almost 10ft). However, in recent years we have had some exceptional and sustained downpours in a short period. For example, in January 2009, almost 150mm (6") fell in 36 hours and fell onto ground that was frozen solid after 10 days of sub-zero temperatures. 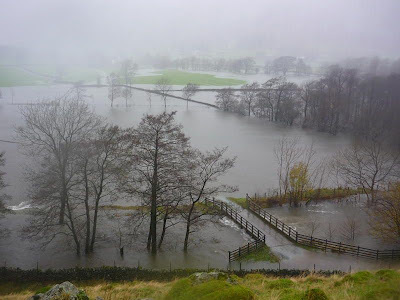 The water ran straight off the fells and overwhelmed the gills and becks, causing flooding. 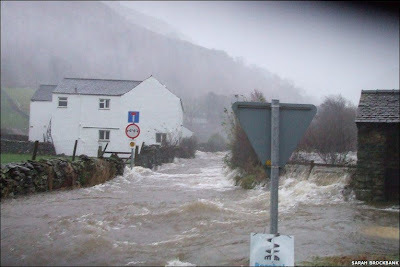 Then again in November 2009, the torrential rain that fell on Cumbria caused severe flooding in this valley. In December 2015 the floods came once more, with 'Storm Desmond' worse than any in living memory. Here are some of the amazing pictures and a video taken during the 2009 flooding.